Modern Crowd is proud to announce our exclusive partnership with MENDO, one of the premier abstract artists to emerge from Melbourne Australia. He specializes in abstract acrylic paintings on canvas. His reputation is growing in Melbourne as he has completed numerous custom corporate projects, and his paintings have decorated homes and businesses all over Australia. The things that intrigued us most about Mendo's artwork were the vibrant finishes, exciting color combinations, and emotionally-expressive abstract designs that grace his canvases. We have been in search of a talented abstract artist for the last couple of years to add alongside our modern metal art, wooden decor, and contemporary lamps. Mendo's designs fit into our modern/abstract/contemporary/urban genre and compliment our other artistic mediums beautifully. We are very selective with the artists we represent (and fittingly, Mendo is selective with whom he allows to represent him) so everything worked out perfectly. 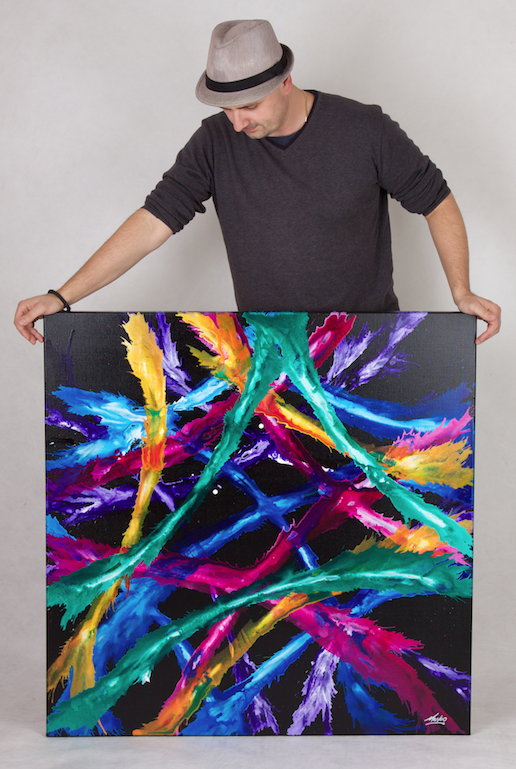 Mendo Vasilevski is an emerging abstract canvas artist hailing from Melbourne, Australia. He is the newest member of the Modern Crowd family, as we were immediately mesmerized by his incredible, colorful designs. Mendo has been designing and painting custom acrylic canvases for both residential and corporate applications. Over the last years, Mendo has completed over 2700 abstract paintings for a diverse clientele, and the popularity of his breathtaking designs has grown rapidly in Australia. Through ModernCrowd.com he will be reaching the US and international markets for the first time in his career! Please note as well that all of Mendo's designs are 100% customizable. By default they are available in 3 standard options: 60x24 single panel, 48x19 single panel, and 60x24 three-panel. However, as every abstract design is 100% hand-painted by the artist himself, feel free to contact us with custom size, design and color preferences and we will promptly respond with a price quote.